We’ve had a great start to the season this week between thoroughly enjoyable clients to fishing that has been producing well. The weather, though not like it was this spring, has been holding and it’s been fairly mild out there for us. 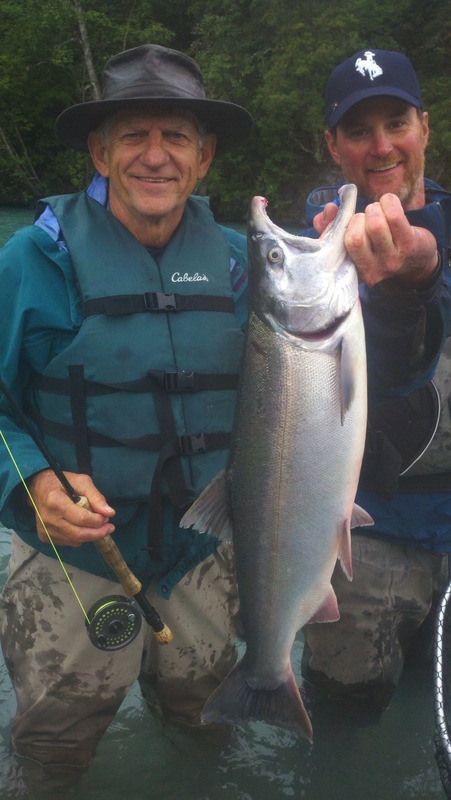 The Rainbow trout and Dolly Varden has been enjoyable and much like we’d expect this time of year. And of course what most people are interesting in is the sockeye and they have been appearing in steady numbers. The count as of now according to the Russian RIver Weir is 4,967. We have had very happy clients going home with some fresh sockeye and they’ve had a great time getting the opportunity to dance with some of these powerful fish on the ends of their rods. There have been some big beautiful salmon caught, looking more like the second run sockeye then the typical little silver bullet the first run traditionally yields. Here’s a returning client we had to opportunity to get out on the water again this year. 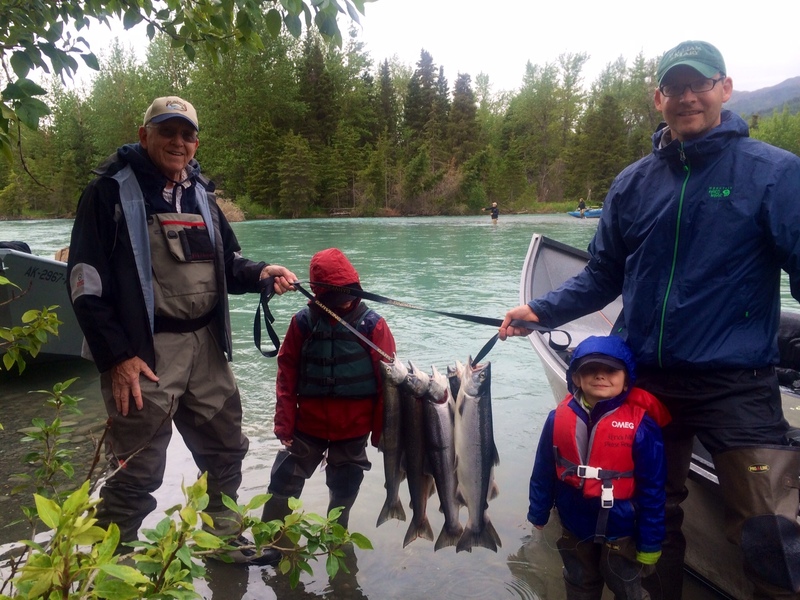 Brian brought his dad and boys down for a great day of fishing (and catching!). Thanks for joining us again! It’s finally here! We have all worked long and hard to get everything ready on our end so that we can get out there and do what we love to do! And today, we are on the water doing just that. Our first run sockeye have already started coming in and are into the Russian River already. 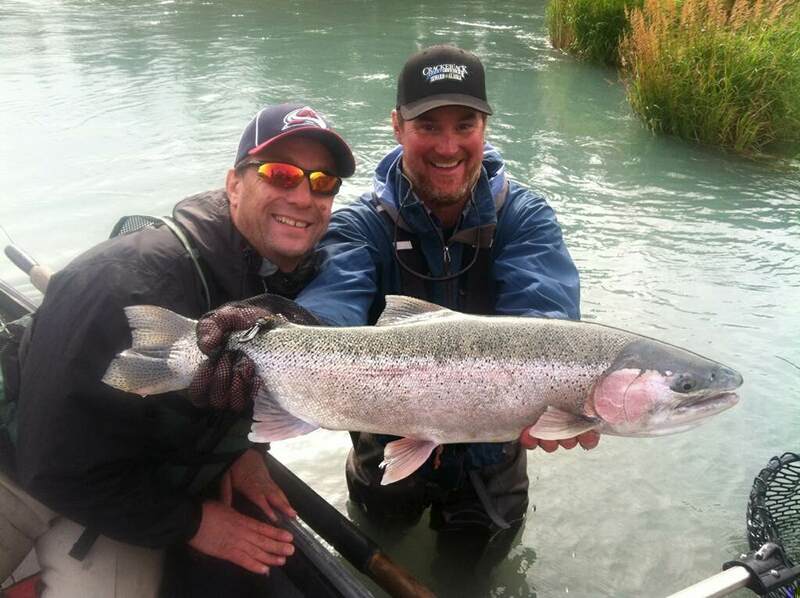 We are having some luck out there catching then on the Kenai today though you have be willing to put in your time. They are the beautiful little silver bullets we love to see though. Trout fishing is open of course today though I don’t have a report back on that yet I’m sure after the break the river has seen that too should be great. More on that later when the boats come off the river. This is what we love to see! 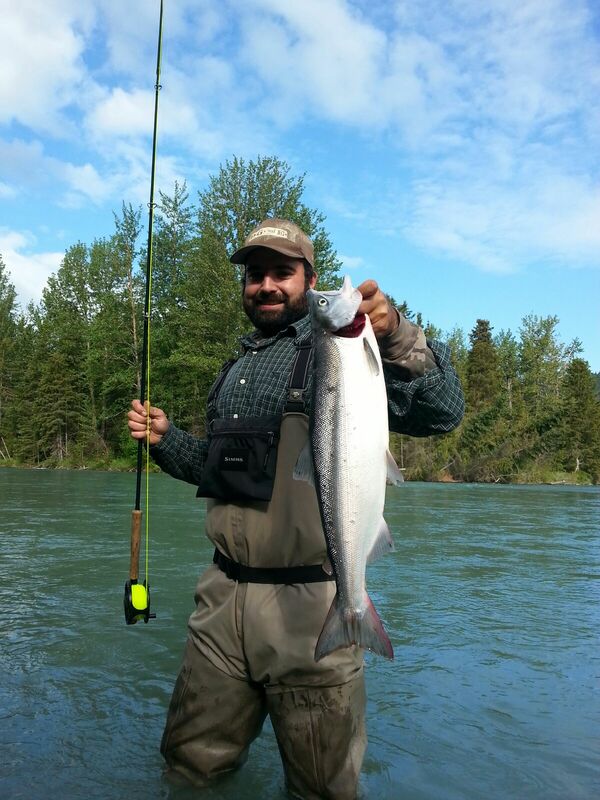 This entry was posted in River Report and tagged Alaska, Cooper Landing, fishing, Fly fishing, Kenai, Kenai National Wildlife Refuge Canyon, Professional Guide, Salmon, Sockeye Salmon on June 11, 2014 by jenharpe. We had a good day out there on the river today with both trips going down the Kenai National Wildlife Refuge Canyon where they were fly-fishing for both Sockeye Salmon and Rainbow Trout. The Sockeye seem to moving through in their usual pods so they are there one minute and gone the next but we are still catching them with a little patience and perseverance. Alaska Fish and Game issued 2 important Emergency Orders and Regulation Reminders. One being that they closed King Salmon Fishing on the Kenai today and the other being that they opened the Russian River Sanctuary yesterday. Please look further down for a copied text of the 2 orders. 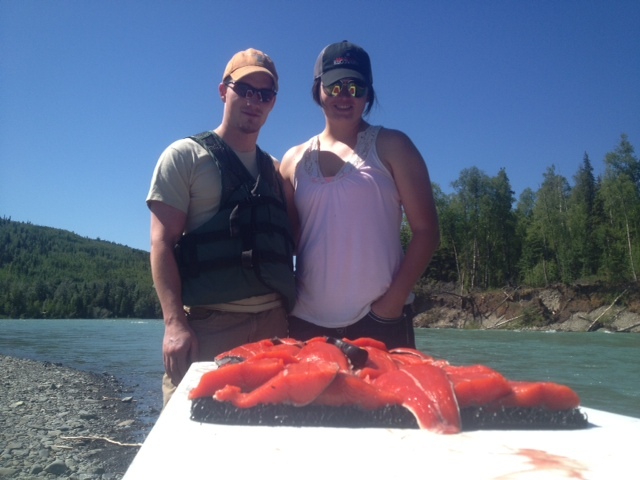 Fresh Russian River Sockeye Salmon caught on the Upper Kenai River by Tyler Parker. Enough to make any sushi chef jealous!! • In the Kenai River: This emergency order closes the Kenai River to sport fishing for king salmon from the mouth upstream to the outlet of Skilak Lake and in the Moose River from its confluence with the Kenai River upstream to the northernmost edge of the Sterling Highway bridge beginning at 12:01 a.m., Thursday. June 20, 2013 through 11:59 p.m., Sunday, June 30, 2013. Sport fishing for king salmon will remain closed from 12:01 a.m., Monday, July 1, 2013 through 11:59 p.m., Sunday, July 14, 2013 in waters of the Kenai River drainage form an ADF&G regulatory marker located approximately 300 yards downstream from the mouth of Slikok Creek upstream to the outlet of Skilak Lake, and in the Moose River from its confluence with the Kenai River upstream to the northernmost edge of the Sterling Highway bridge. This closure prohibits all sport fishing for king salmon, including catch-and-release fishing. King salmon may not be retained or possessed; king salmon caught while fishing for other species may not be removed from the water and must be released immediately. • In the Russian River: This emergency order opens the Russian River Sanctuary Area to fishing for sockeye salmon at 8:00 a.m., Wednesday, June 19. 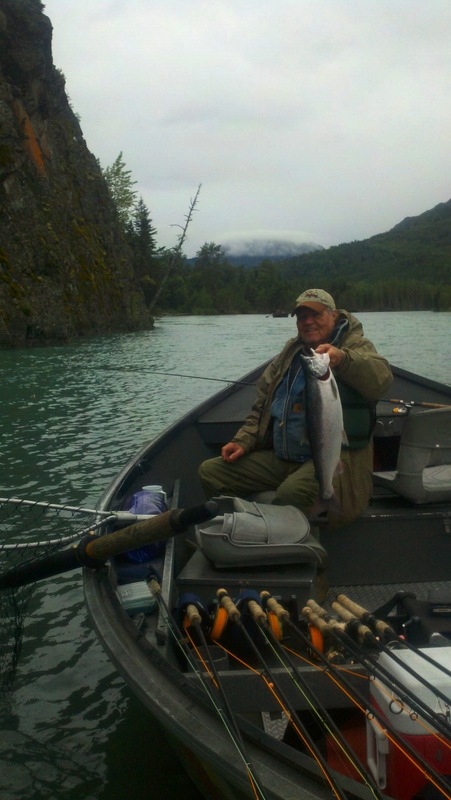 This entry was posted in River Report and tagged Fly fishing, Kenai National Wildlife Refuge Canyon, kenai river, King Salmon, rainbow trout, Skilak Lake, Sockeye Salmon, upper kenai on June 20, 2013 by jenharpe.